Huawei E5186 is the top model for 4G router with support for LTE Advanced Cat.6 and receiving data rates up to 300 Mbit/s. It’s well suited as a professional solution for enterprise or medium-sized office. Today, we write a review of this new router. Comparing with the price when the E5186 router come out, the price is now more acceptable for common users. 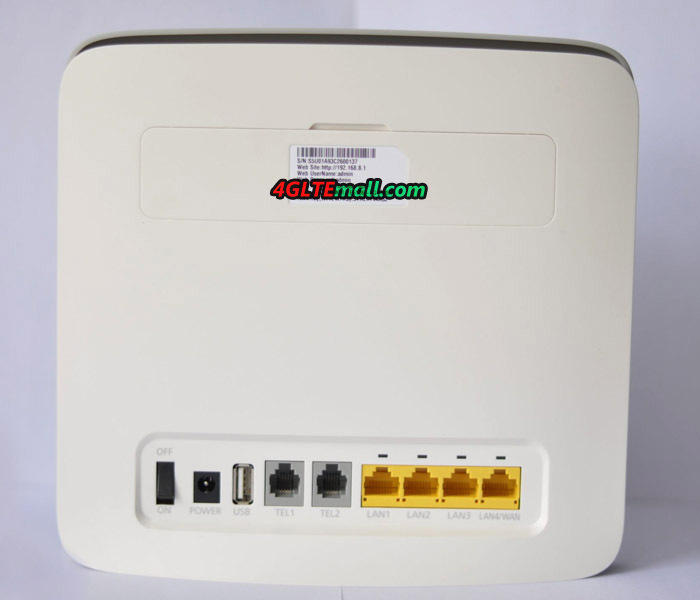 In most cases, you can get the E5186 router from local network provider, and the router is locked to the local provider’s networks, which means you cannot use other operators’ sim cards. What we get is the unlocked one, so we can use the Huawei E5186 with any compatible networks. The stationary router E5186 is powered from 220V (adapter), no built-in battery is provided. E5186 LTE Router supports complete set of frequencies and technologies, including LTE Advanced Cat.6 and everything below 4G/3G/2G. Wi-Fi support 2.4 GHz and 5GHz simultaneously. Connect up to 32 users over Wi-Fi, plus a four-port Ethernet and 1 Gbit/s for the wired connection. With the original Huawei package, Huawei E5186 has only few accessories, including an Ethernet cable for connecting, a user manual and AC adapter for 12 V and 2 A. If the router was purchased with the tariff, you may also get a SIM card(Micro SIM). Without the tariff, the price may be better. The E5186 design is nothing special just like the predecessor model Huawei B890 and B593 LTE CPE. But it’s structurally made ​​interesting, front and rear panels are symmetrically curved in opposite directions. The color of Huawei E5186 is white with light gray sides. The power button is with the Ethernet ports. The WPS and WiFi control button is at the body side, above is the SIM card slot which is covered by a small cap. The E5186 dimension is 191x197x62 mm, which will not take much space on the table or windows. 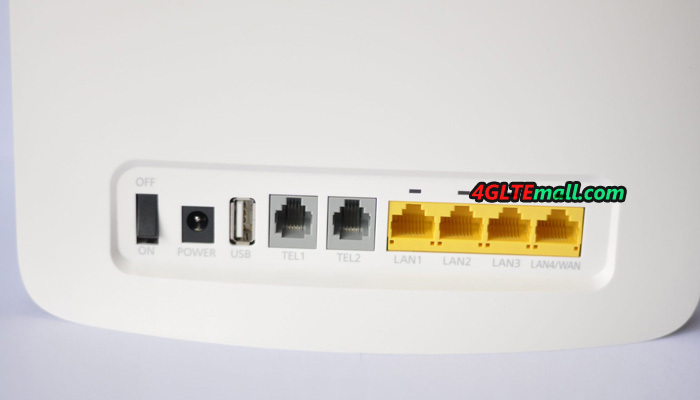 The separate power switch for on and off is with four Gigabit LAN Ethernet-ports, one of them part-WAN port for cable connecting the router to your ISP. USB-connector is used for wireless sharing, such as an external drive or printer. Two telephone RJ11 connectors for the organization of an IP-telephone. At full load the E5186 router is properly heated. There are many vents in the body, we can see from outside, on top and bottom of the router, the small vents would help the heat radiation quickly. When the LTE CPE E5186 is working, the panel display in operating mode, for each color mode. Green when operating in 2G networks, blue for 3G and 4G when connected to an external provider of broadband internet. Perhaps there is not enough space for indicator of connected users, and traffic volume, but this would not hurt. Fortunately, enough free space on the panel. Apparently, the manufacturer assumed that the buyer of serious professional devices, they do not care such trifles, and if concerned, user can check through the Web-based interface. We are very pleased with the automatic backup with a priority of the external connection mode. When disconnecting a wired broadband router, the E5186 would switch to its own modem to connect an external source and it will automatically switch to the Internet to distribute it. Moreover, the entire switching procedure takes less than 15 seconds. The main selling point for the E5186 router is to support LTE Advanced Cat.6 and receiving data rates up to 300 Mbit/s. Theoretically, this connections speed is almost double of current LTE Cat4 speed (150Mbps). Ironically, most network providers haven’t upgraded their networks to LTE advanced, current mainstream is LTE cat4 network. 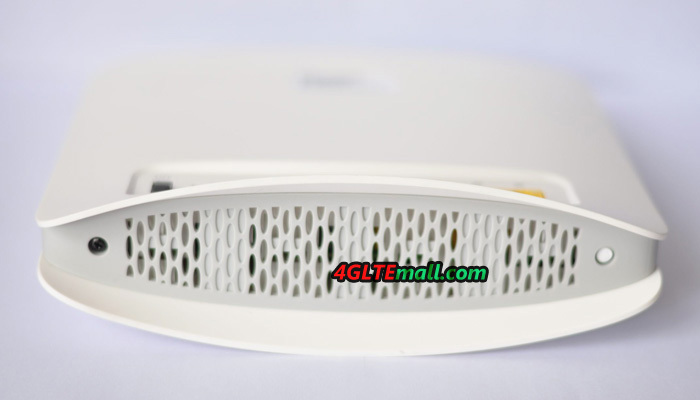 So for many users, the Huawei E5186 router is future proof. Another important advantage of Huawei E5186 router is simultaneous operation of Wi-Fi router in standard 2.4 and 5 GHz bands. “High” and not noisy Wi-Fi 5GHz is now ubiquitous even in low-cost routers. It’s better than only 2.4 GHz with no options, but it is useless for a large number of connected users. All the same, we have to choose 2.4 GHz for compatibility with all devices. 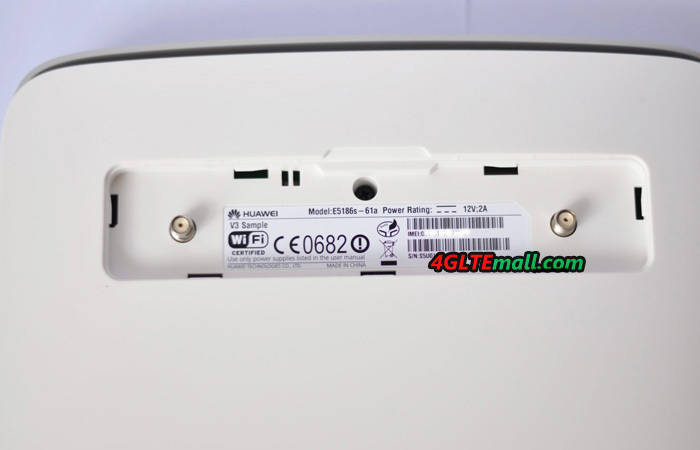 Huawei E5186 can default create two independent Wi-Fi networks, and the user chooses the module based on the capabilities of your device, or the distance to the router. By the way, here we can for the first time face the Wi-Fi-transport as a “bottleneck”: in a good reception, LTE Advanced router will not be able to deliver on the best speed for your computer, which is able to take from the Ethernet. 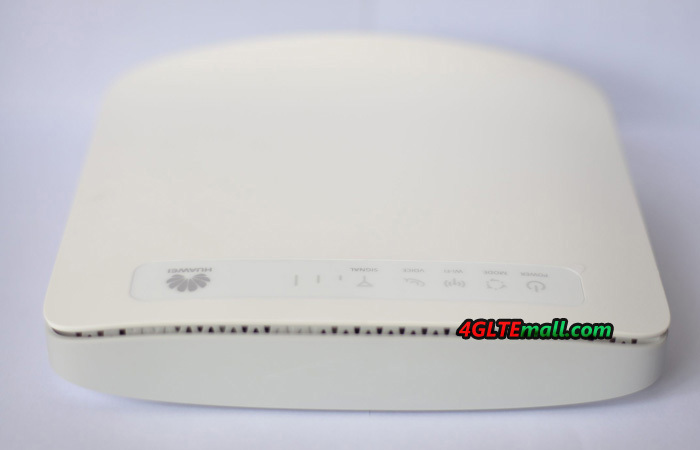 Like many other Huawei 4G LTE Routers, the operation of the Huawei E5186 router could be done via web-based interface or mobile phone application named Huawei Mobile WiFi, which now becomes even better and more convenient after a few updates. In a typical LTE network (LTE Advanced), the Huawei E5186 shows speed performance twice than what I had seen on other devices. Of course, we are talking about a specific place, and the SIM-card is rearranged in different devices. In our test, the Huawei E5186 consistently gave 30-50% speed more than other routers and modems. The Huawei E5186 router can achieve 30 Mbit/s easily on measurements at almost any time of day, and the rate of “around” 40-45 Mbit/s is nothing special. Data transfer rate in the network for upload was always higher than 10 Mbit/s, which was also a pleasant surprise to me. From the point of view, the ordinary use of the Internet is very convenience, and I did not see the difference from wired connection. The price of the Huawei E5186 is a little bit expensive now. It is of course a progressive and avant-garde. But with the latest technology and good performance with fast & stable connection, the E5186 router is worthy this price. If you already read our reviews months ago, you may also get to know another model from huawei for the LTE advanced Category 6. The model number is Huawei E5786, which is pocket router with a large capacity battery; user can take it for outdoor activities or business trips. If you are not interested in the stationary router E5186, E5786 may be the right one.